Today I found the time to scan some negatives I want to work with and finally hooked up my printer for the first time. It works! I’ll slowly describe the steps I took to get to the results I’ll be showing. This is a testing phase for me so by no means will the settings I used and show here be perfect. This is meant to keep track of what I’m doing so I can trace back my steps when things go wrong. If you find anything worthy of noting or think certain things best needs changed please leave a comment! I could of course just scan an image, convert it to black-and-white if it wasn’t already, invert it so that I have a negative and fiddle around with the density as long as I deem necessary. However, this is a highly experimental approach with results not being able to be repeated when needed be. After looking around on the net for awhile I decided to start out with the ChartThrob method as I found on Jalo Porkkala’s website. First thing is go to their website as linked above and add the jsx file to “presets” -> “scripts” in the Photoshop folder in Applications (Mac). 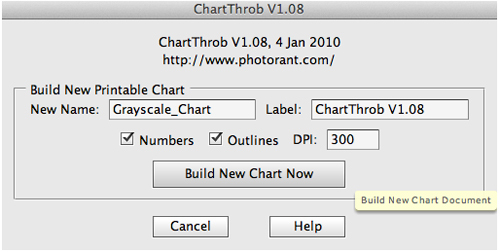 When you (re)start Photoshop you will find this under “file” -> “scripts” -> “chart throb”. Click on the latter to start it up. 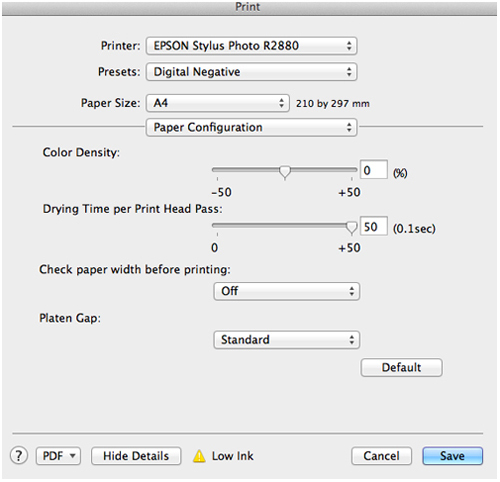 After the print has dried scan it while making sure you have a linear scan (gamma 1.0) with a full grayscale range. 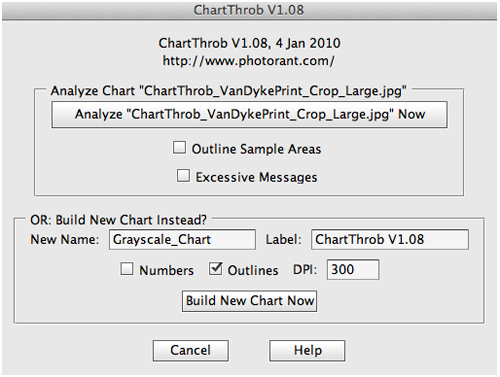 Crop the scan back to the boundaries of the chart and open ChartThrob again. 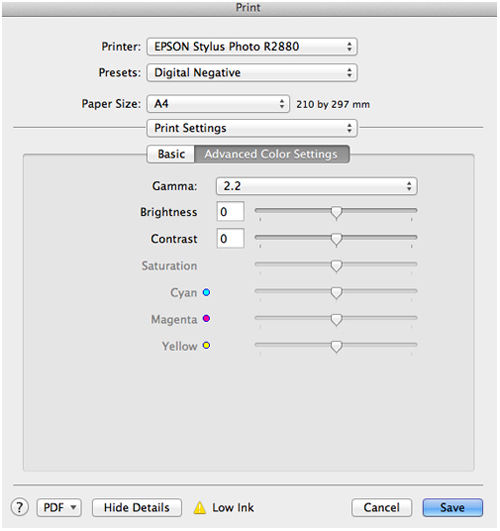 Choose the option “Analyze ‘InsertYourFilename.jpg’ Now”. 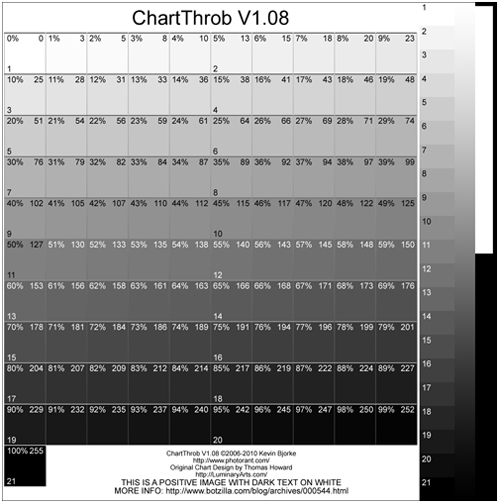 Once it has analyzed the chart you get your curve which you can then save and/or use immediately on a black-and-white image. 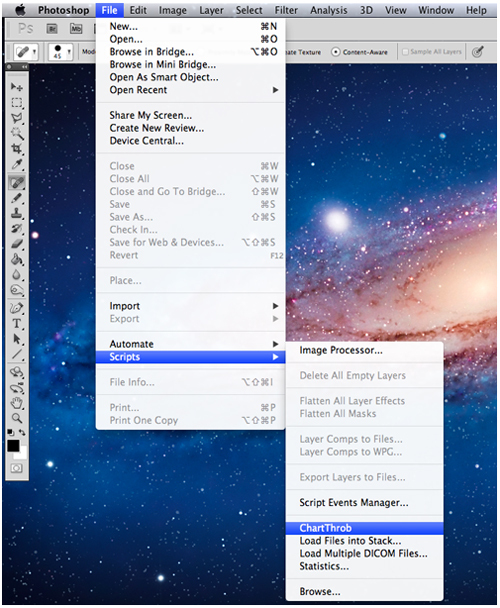 It should make your image appear grayish and washed out on the screen. This should be correct for printing and you’re ready to go. However, the curve I’m getting so far doesn’t seem good. I think I’ve overexposed the print with the gray scale on it so I’ll be making a new one. Updates on this will follow asap. This is the end of part 1. 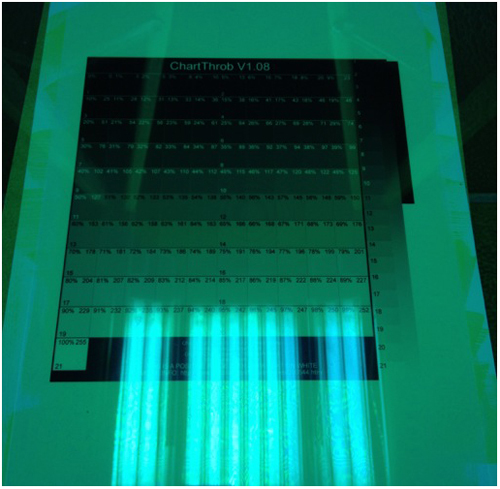 If you’ve made a proper print with the gray scale chart on you should get a proper curve when correctly scanned. Putting this theory into practice is something different I’ve already noticed. As soon as I have a curve that pleases me I’ll report back. Last week I received an all-new Epson R2880 (for free 😮 :yeay:) to be printing my digital negatives with. 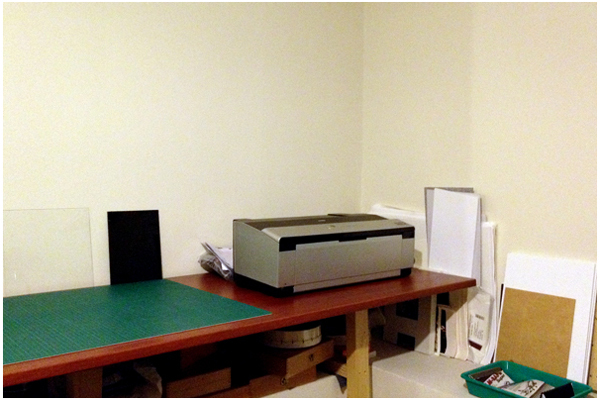 Last night I gave it a nice spot in my darkroom. It’s actually situated on the table where my Durst DA900 and M605 used to be. They recently moved to the attic as they, since the arrival of the all-magic Omega D2, were not being used anymore. The Durst DA900 is actually an illogical beast compared to the Omega D2. Maybe just to me but the latter just works better for me. Anyway, so now the table is about digital negatives and cutting photos, papers etc. I still have to hook it up to the power supply but my current cable is a meter short so haven’t tried it yet. Bought all the cartridges (oomph) so it’s ready to be installed. I’ve been playing with the thought of making digital negatives for quite some time now. One day I’d think, hell yes that would be awesome, while the other day was more like, hell no, I prefer shooting negatives instead of inkjet-printing them. Since a couple of days I’m seriously considering this option. The event that triggered me to look at this option in a more serious manner was the meeting I had with William Ingram the other day. He solely prints from digital negatives, platinum prints that is, and these were so awesome to look at I felt kind of baffled. This had a lot to do with the size of them, I have to admit, seeing that they were about 80 x 110cm (!). I am a sucker for large formats (photography/ paintings), always have been, and these were astonishing to behold. However, just big and being useless in my workflow will not cut it either so I have managed to come up with a convincing argument for diving into this. I am starting to work with more contact printing processes such as albumen printing, Van Dyke process etc. and I have a ****load of 35mm and 120 film negatives laying around waiting to be printed (again). Only, traditional b+w printing is something I probably won’t ever go back to out of free will so this will give them a new purpose in life besides endlessly waiting on a bookshelf. 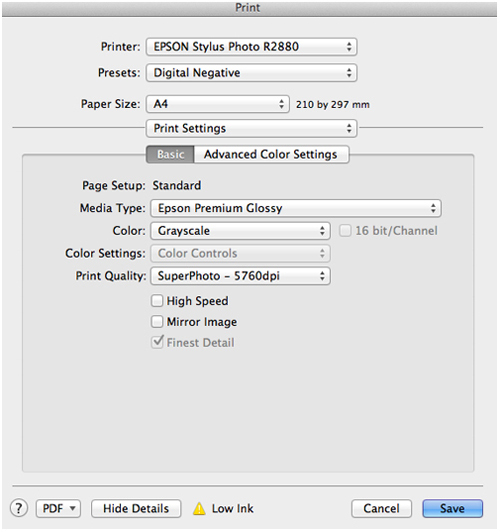 I (hopefully) have an option to buy a Epson R2880 pretty cheap so that’s my printer of choice. I hope to close the deal in the upcoming week. 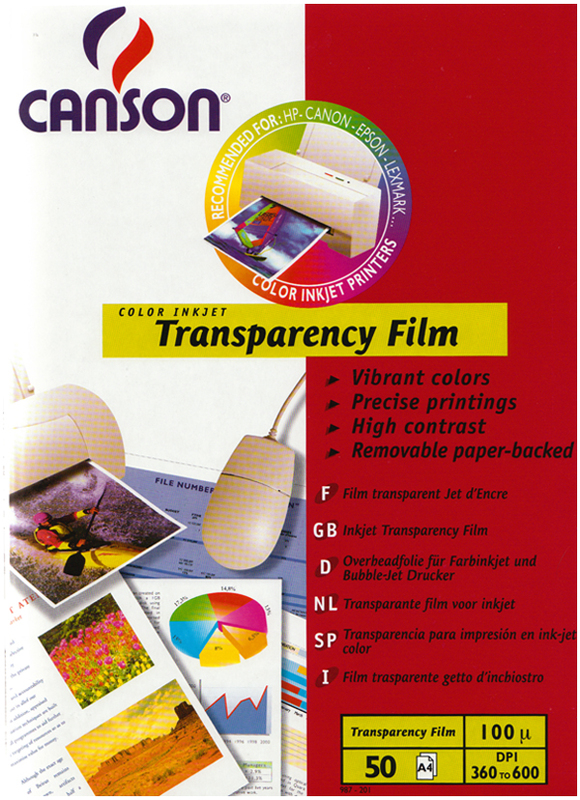 I’m still debating on which transparency film I’ll be working with, Agfa Copyjet, Inkpress or something, the first mentioned probably more easily available to me. There are several options to fine-tune the workflow by using Quadtone Rip but I’m still looking into that as well. I’ve thought about following a workshop but maybe I’ll give it a go like this seeing that I can find a lot of information online, from books and from friends. Anyway, I firstly want to improve my collodion negative-making skills but more will follow on this for sure! All Collodion Formulas Prepared - Ready for Testing! All material on this site not covered by other copyright and not explicitly marked as public domain is copyright © Indra Moonen, the year being that of the last update. If you would like to include any material of this site on your website or in printed material for sale, just contact me, and be sure to tell me what use you hope to make of it. I may be able to provide you better material.